At least eight people have been killed and more than 20 are injured in a serious traffic accident on the Skopje-Tetovo highway. The wounded persons were taken to the Emergency Center in Skopje. According to reports of this center some of them are at risk for life. The victims and the injured werethe passengers of the bus company "Durmo Turs", who went out of the road and rotated near the village of Llaskarca. 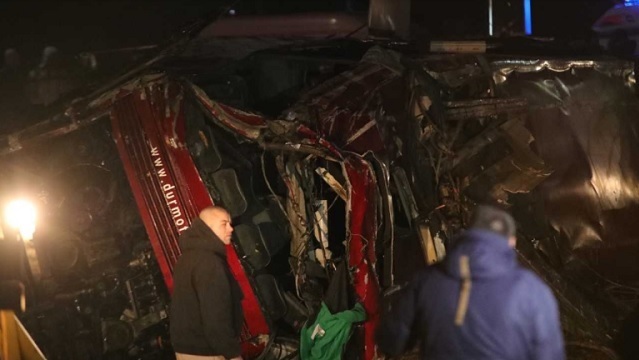 The mayor of Gostivar, Arben Taravari, has announced that most of the passengers traveling by bus accident are from Gostivar and the surrounding area. According to him, 4 injured were sent to the Emergency Department in Skopje, while the 20 others toward the "September 8" hospital. According to Taravari, some of the persons are in critical condition. The causes of the accident are not yet known, but it is suspected that the bus lost control after a tire blasted. Expert teams are at the scene and are investigating the causes of the crash.